Apr 22 – Dec 22, 2018 weekly rates based on pay for 6 nights get the 7th night free. Government Room Tax: A $6.50 per person per night government room tax will be applied to all nightly rates for ages 13 and older including any free nights. If traveling with infants: Please be sure you have notified us if you will need a crib reserved for a one time fee of $20.00. Grocery stocking service is available on a limited basis with a 15% service charge and US$ 15 transportation costs. All Packages Include: 7 Nights Accommodation in a fully air-conditioned condo with one ensuite bathroom per bedroom, private balcony, open concept kitchen, dining area, living area with LCD cable TV, DVD player, phone and free Wi-Fi, 7 days full American Style breakfast buffet at our waterfront restaurant, roomtax and 7 Car Rental of one manual transmission 4-5 passenger truck per unit. 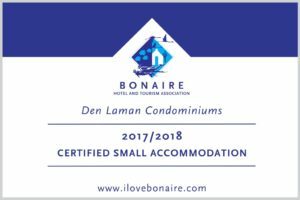 Bonaire Dive packages include: 6 days unlimited tanks for shore diving available 24/7, weights and weight belt, and boat dives as stated with PADI 5 Star Dive Friends Bonaire. The 6 day package is over 6 consecutive days. The two-tank boat dives do not need to be on consecutive days and can be taken on any days within the 6 day period. *Free Nitrox upgrades for Nitrox Certified divers through December 15, 2018. Free Wi-Fi is available throughout the resort. Free secured & fast Wi-Fi is available in-room. Not included: Packages do not include the following: (1) $25.00 Dive Tag or $10.00 Nature Fee Tag, (2) Nitrox upgrades for $20.00 per person per week for Nitrox Certified Divers after December 15, 2018, (3) recommended vehicle insurance, additional driver, gasoline and other rental-agency imposed charges related to loss or damage, (4) any voluntary dive and hotel staff gratuities. Bonaire Dive packages include: 6 days unlimited tanks for shore diving available 24/7, weights and weight belt, and boat dives as stated with PADI 5 Star Dive Friends Bonaire. The 6 day package is over 6 consecutive days. The two-tank boat dives do not need to be on consecutive days and can be taken on any days within the 6 day period.